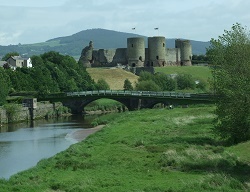 Explore the attractions and panoramic countryside with a leisure break in Wales. With so much to do in this small country the possibilities are endless. Enjoy a day relaxing in the spa and a drink in the sunshine or pack your exploring gear and explore the local area or even further afield. Our leisure breaks are the best way to find amazing rates that still include use of all of the hotel leisure facilities with a range of meal option packages. Within wales we have the Cwrt Bleddyn Hotel & Spa which offers our lowest one and two night midweek leisure break special offers anywhere on our website. This lovely hotel in the Welsh countryside is positioned perfectly for a day trip into the Welsh capital of Cardiff. Or, for that very special treat, why not enjoy a break at the stunning Ruthin Castle located in Denbighshire. Great rates on special offer deals can be found at this venue.